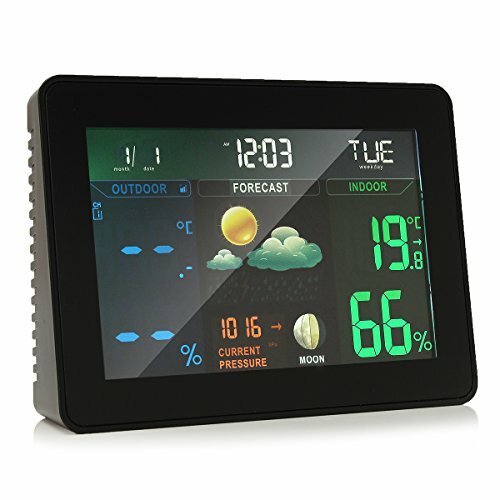 Measure Indoor / Outdoor Temperature / Humidity and Barometric Pressure. Weather forecast: Sunny, Partly Sunny, Cloudy, Rainy and Stormy. Display Moonphase (New Moon, Waxing Crescent, 1st Quarter, Waxing Gibbous Full Moon, Waning Gibbous, Last Quarter and Waning Crescent Colorful screen display with adjustable LED backlight (HI/LOW/OFF). Up to 3 outdoor transmiiters receivable (note: comes with 2 sensor is included in the set). Temperature Indoor: 0~50°C (32~122°F) & Outdoor: -40~60° (-40~140°F).